Pre-requisites: PHI 328 (History of Ancient Philosophy) or its equivalent is helpful but not required. The Hellenistic philosophers (the Epicureans, Stoics, and Academics) take their name from the Hellenistic Age, the time in which they lived (the period from the death of Alexander the Great in 323 to the end of the Roman Republic in 31 BCE). This is not a period in the history of philosophy, but it is traditional to treat the Hellenistic philosophers as a group because they were united in their critical reaction to what they thought were the excesses of the prior classical tradition, the tradition of Plato and Aristotle. This critical reaction began to disintegrate around 100 BCE as non-skeptical forms of Platonism undergo a resurgence and eventually give rise to early forms of Christianity. This change in outlook traditionally marks the end of the Period of Schools. West end steps of the Ποικίλη Στοὰ. 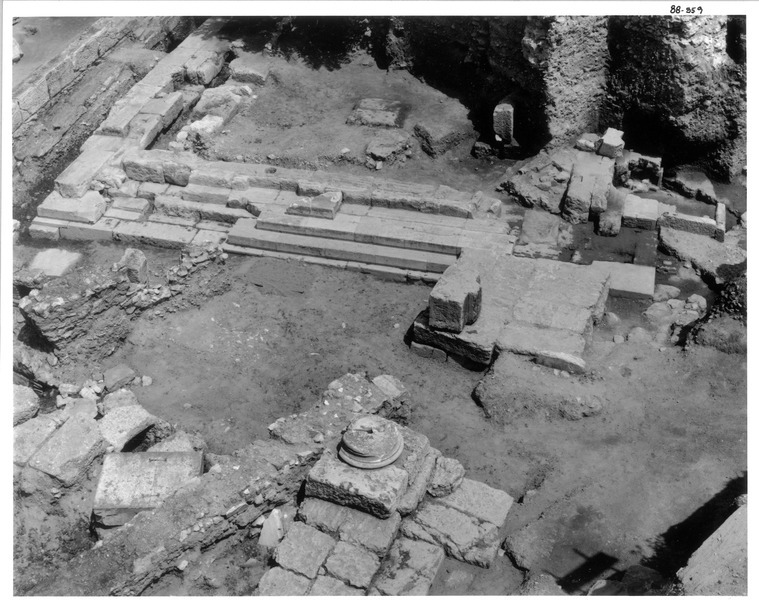 In the foreground is part of the foundation for the Hellenistic Gate, which allowed access to the Agora from the north. The reading for the course is from the ancients and from the secondary literature. The contemporary literature on the Stoics and Academics is voluminous. The focus in this course is on some of the work that sets out the most common interpretation of the debate. All the readings are linked through this syllabus and are available either to anyone on the internet or to through the ASU library to those who have an ASURITE ID. Cicero heard Philo's lectures in Rome in 88-87 BCE (Brutus 306) and Antiochus' lectures in Athens in 79-77 BCE (Acaemica 1.14). Philo (2nd to 1st century BCE) was the last head of the Academy. Antiochus became a member of the Academy at about the time Philo became head, was initially a follower of Philo, but later broke with him (Academica II.69). The letter grade for the course is a function of the point grades on four writing assignments, five discussion posts, and a bibliography project. Each writing assignment is worth 10 points. Each discussion post is worth 8 points. The bibliography project is worth 20 points. In a discussion post, you are to call attention to something in the reading you found interesting and you are to explain why you found it interesting. These posts must be thoughtful. Discussion posts written with little care and attention to detail will not receive full credit. In the writing assignments, your answer should demonstrate that you understand the historical and philosophical issues related to the question. The best way to demonstrate your understanding is to provide answers understandable to someone who does not already know the answer. In the bibliography project, you are to analyze five academic journal articles or book chapters from the scholarly literature on issues related to the debate between the Stoics and the Academics. The assignments (40 points), discussions (40 points), and bibliography project (20 points) total to 100 points. There is no extra credit, and late work is not accepted without good reason. The point total determines the letter grade: A+ (100-97), A (96-94), A- (93-90), B+ (89-87), B (86-84), B- (83-80), C+ (79-77), C (76-70), D (69-60), E (59-0). Incompletes are given only to accommodate serious illnesses and family emergencies, which must be adequately documented. We will read excerpts from Cicero's Academica and some of the secondary literature on the debate between the Stoics and the Academics on the nature and possibility of knowledge. The Academica is reconstructed from fragments of two works. The first (Academica Priora) consists in the now lost Catulus and the Lucullus. The second (Academica Posteriora) consists in the Academic Books, of which only part of the first book has survived. Academica I is what remains of the Academic Books. Academica II is the Lucullus. Academica I (Varro) is Varro's speech on the history of philosophy according to Antiochus (Academica I.15–42) and Cicero's alternative from an Academic point of view (Academica I.43-46). Academica II (Lucullus) is Lucullus' speech on Stoic epistemology (Academica II.10–62) and Cicero's speech in reply from an Academic point of view (Academica II.64–147). Zeno of Citium, 334-262 BCE. Founded the school in about 300 BCE. Cleanthes, 334-230 BCE. Succeeded Zeno. Chrysippus, 279-206 BCE. Third and most influential head of the Stoic school. Panaetius of Rhodes, 185-109 BCE. Posidonius of Apameia, 135-51 BCE. Marcus Aurelius, 121-180 CE. Roman Emperor from 161-180 CE. The Stoics thought that knowledge is possible because there are "cognitive impressions." For the Stoics, impressions are representations. In adults, the contents of impressions are propositions. A cognitive impression can only have a true proposition as its content. Nature in its providence constructs human beings with the ability to assent to these impressions and thus makes it possible for them to have the knowledge necessary to live good lives. The beliefs they form in assenting to cognitive impressions are true. Moreover, in the absence of false beliefs, Socratic questioning cannot force assent to a cognitive impression to be withdrawn because no argument whose conclusion is the negation of the propositional content of the cognitive impression is valid. What is a cognitive impression? What is knowledge and how does it involve cognition? Passages from Cicero (and Sextus Empiricus and others) about the Stoics. ⊕ Sextus Empiricus was a physician (in the empirical tradition) and philosopher (in the Pyrrhonian tradition). In a list of Empiricist physicians, Diogenes Laertius mentions "Sextus the Empiricist" (Σέξτος ὁ ἐμπειρικός) (Lives of the Philosophers IX.116). In Against the Grammarians, Sextus Empiricus says that he himself wrote a (now lost) set of discourses on Empiricism (Against the Grammarians). Sextus Empiricus' surviving works include the Outlines of Pyrrhonism and the works preserved under the title Against the Mathematicians (Adversus Mathematicos). Against the Logicians I and II is M VII and M VIII. Against the Ethicists is M XI. "Stoics and Skeptics on Clear and Distinct Impressions," Michael Frede, 151-163, 166-170. You are free to discuss the assignment and to post questions about it. Arcesilaus, 315-240 BCE. Arcesilaus succeeded Crates (the fifth head of the Academy), changed the focus of the Academy, and initiated the "New" Academy. Carneades, 214-129 BCE. Carneades is Arcesilaus' most distinguished successor. Clitomachus, 187-110 BCE. Clitomachus succeeded Carneades. Philo of Larisa, 160-83 BCE. Philo was the last head of the New Academy. Antiochus, 2nd to 1st century BCE. Antiochus broke away from the New Academy, tried to reestablish the "Old" Academy. Aenesidemus, 1st century BCE. Aenesidemus broke from the New Academy to found a new skeptical movement under the name of Pyrrho. (Pyrrho lived in the 4th to 3rd century BCE. He seems to have pursued a skeptical way of life but wrote nothing and established no school). A new outlook entered the Academy in 265 BCE with Arcesilaus, who succeeded Crates as the sixth head of the Academy Plato founded almost a hundred years ago in 387 BCE. Arcesilaus refocused the Academy by interpreting Plato's dialogues in terms of the Socratic practice of exposing the pretense to wisdom. The Academics took the Stoics as their primary target. Against the Stoics, the Academics argue that no impression is cognitive because for every true impression there is a false impression indistinguishable from it. On the basis of this premise, the Academics invite the Stoics to admit that it is necessary to withhold assent. 1. For every true impression, there is a false impression indistinguishable from it. 2. If (1) is true, then no impression is cognitive. 3. If no impression is cognitive, then it is necessary to withhold assent. 4. It is necessary to withhold assent. The Stoics accept premises (2) and (3). The Academics argue for premise (1) on the basis of the impressions of apparently indistinguishable objects (such as identical twins) and on the basis of states of mind such as dreaming or madness in which false impressions are indistinguishable from the true impressions one has when one is not dreaming or not suffering a fit of madness. Passages from Cicero (and Sextus Empiricus and Diogenes Laertius). "The sceptics," Michael Frede, 262-280. "Introduction," On Academic Scepticism, Charles Brittain, xix-xxiii. In opposition to the Stoics, Arcesilaus seems to have said that "there is nothing that can be known" and that therefore "we should not assert or affirm anything, or approve it with assent" (Academica I.45). Given that he did say this and that in saying this he did not straightforwardly contradict himself, he cannot be understood to have assented to the view that no one should assent to any view. Still, because it remained unclear exactly how he should be understood, it became a problem within the Academy to understand his opposition to the Stoic pronouncements in epistemology. This opposition had become a defining feature of the Academy, and there was the worry that the integrity of the school would be undermined if the problem went unsolved. Carneades (who became head of the Academy sometime before he was part of the Athenian embassy to Rome in 155 BCE) seems to have take the first important step in explaining how the Academics can argue against the Stoics without assenting to the view that no one should assent to any view. Carneades seems to have tried to understand and defend the rationality of assent and to say that assent is permitted to "persuasive impressions" (πιθαναὶ φαντασίαι). Passages from Cicero and Sextus Empiricus. "The Skeptic's Two Kinds of Assent," Michael Frede. "Introduction," On Academic Scepticism, Charles Brittain, xxiii-xxxi. There was a disagreement within the Academy about how to understand assent to persuasive impressions. Clitomachus (who became head of the Academy after Carneades) and the Clitomachians were on one side of this dispute. Philo (who became head of the Academy after Clitomachus) and the Philonian/Metrodorians were on the other side. (Metrodorus was a follower of Carneades. Cicero refers to Philo and Metrodorus together in opposition to the interpretation of Carneades that Clitomachus and the Clitomachians championed (Academica II.78). "Epistemology from an Evaluativist Perspective," Hartry Field. "The Clitomachian and Metrodorian/Philonian Justifications of Academic Assent," Thomas A. Blackson (forthcoming in What the Ancients Offer to Contemporary Epistemology (edited by Stephen Hetherington and Nicholas D.Smith), Routledge). ⊕ "[It is called] 'Pyrrhonean (Πυρρώνειος)' from the fact that Pyrrho appears to us to have applied himself to Scepticism more thoroughly and more conspicuously than his predecessors" (Outlines of Pyrrhonism I.1.7). Aenesidemus (1st century BCE) broke from the Academy and founded new skeptical movement named after Pyrrho (who pursued a skeptical way of life but wrote nothing and established no school). Sextus Empiricus' Outlines of Pyrrhonism is the primary source for the Pyrrhonians. "The sceptics," Michael Frede, 280-284. "An empiricist view of knowledge: memorism," Michael Frede.